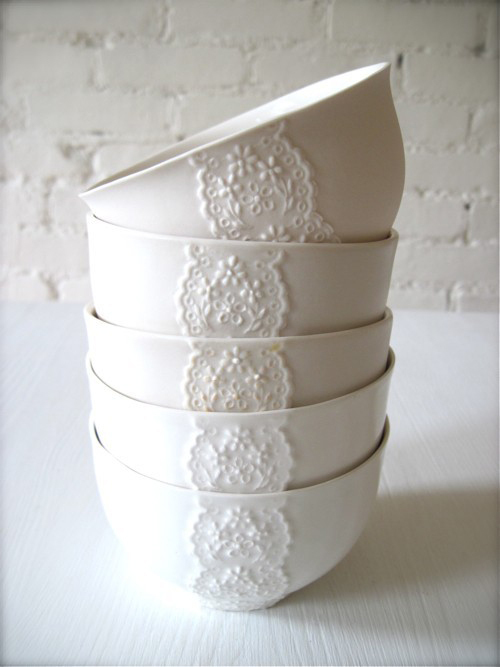 Today I’m loving … these paper thin porcelain lace bowls from Etsy shop Hideminy. Hidemi was born and raised in Tokyo, Japan where she earned her degree as a fashion designer. She sees beauty and joy in just about everything and wants to express it through her ceramics. prachtig, zo gestapeld zou het ook een mooi decoratiestuk in de woonkamer zijn!! So delicate! Thank you for sharing! These are so pretty! Would love to have them in the kitchen and the dining table! Wow, these are lovely! I think they look lovely in my kitchen. Thanks for sharing this with us. I’m very surprised and so happy!! I am very glad for my work to be featuring in my loved blog.